This is all a little bit too exciting! Today – we announce our winner of the MAMMOTH giveaway we’ve been so delighted to have on offer to celebrate the new site launch. 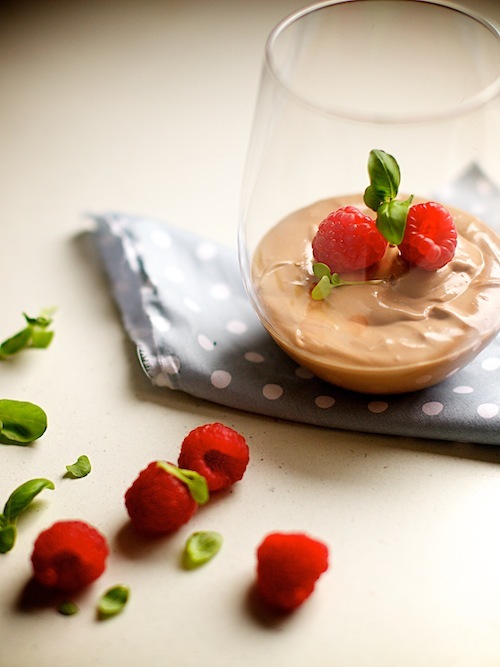 Before we get there – I’m also sharing with you today, my revamped Chocolate Mousse! We’ve been recipe testing at Kringo HQ to make sure that the recipes in Fertilise Yourself are as delicious as ever – we’ve substituted some ingredients to make it more delicious and more nutritious. You will want to give this one a try – it’s so darn freaking delicious – my team sampled it last week, their tongues were stuck to the side of their bowls savouring every last lick! Somebody even made their way into MY serve before I got there… Anyway, don’t take my word for it – you can now make it yourself. This recipe is from my soon to be gone e-book Fertilise Yourself. Remember you can currently get your hands on a copy at 50% off making it $9.95! Do that too, so you can totally have your meal plans sorted for the coming weeks before it’s goneski. Combine coconut cream, maple syrup and peanut butter. Add in the cooled melted chocolate and beat, whisk or blend until it resembles the consistency of mousse. Serve and garnish. Stunningly delish! Aaaaand on that note DRUMROLL PLEASE….. 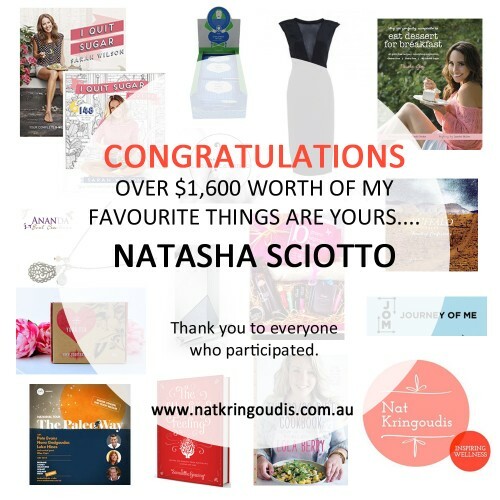 The very very fortunate winner of my MASSIVE GIGANTIC GIVEAWAY OF ALL TIME GOES TO…. We will be in touch with you shortly to organise getting you this mega swag of goods! What a way to celebrate this beautiful new online home of mine. The biggest of thank you’s to all the awesome people that participated, and of course a HUGE thank you to the people and companies that contributed such amazing products. Lola Berry, Earth Events, Sam Gowing, Wes Carr, Ananda Soul Creations, Proplenish, Bkind Organic Beauty Bar, JOM, YourTea, Forage, Sarah Wilson, Loving Earth, Nicole Joy, Watson x Watson & Lisa Taranto. How many does the chocolate mousse serve? That’s way too much for one serving surely!?! Thank you SO SO much Nat – this has truly made my year! I cannot wait to receive all of the goodies and funnily enough, when I found out the news, I had just bought a new organic cleanser and was eyeing off some Luvju Chocolate, but I resisted… Who would have thought that I would then be gifted with a whole box and plenty of other amazing things- how incredible is that! Really love the new website, and the e-book is loaded with so much info. Thank you from the bottom of my heart. Hey Nat …. Love love the new and improved mousse. Excuse my ignorance but is it okay to have peanut butter? Thanks again for all your information … Love it. How long does this keep? Can you make it the night before?